You can argue about climate change or what causes it, but you cannot argue with hail. It hits Wylie like something out of the Bible: stones that could slay Goliath breaking through roofs and landing in living rooms, shattering windows and destroying cars. The storms typically last less than half an hour, but a home can be wrecked in less time than that. Jonathan Hernandez is about to climb a roof in nearby Plano when his phone starts ringing. 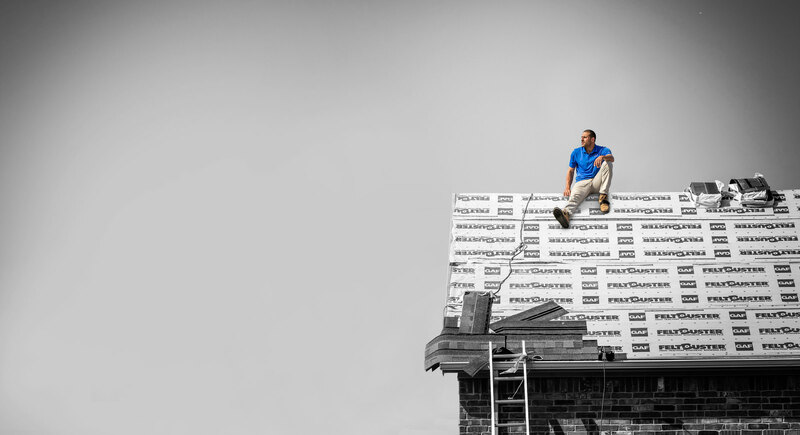 He has been a roofer for less than a year; he has owned his company, High Rise Roofing, for just a few months. But it doesn’t matter. Word spread in Wylie after a smaller storm hit one month ago: Call Jonathan. He’ll take care of you. He ensures that shingles are placed carefully and he prods insurance companies until they cover everything they’re supposed to cover. He’ll ask a client what name they prefer being called, because sometimes Robert prefers Bobby or Kim prefers Kimberly. And now the people of Wylie are pleading: Jonathan! Jonathan! We need you! Now! They can’t wait. Another rainstorm is forecast for the next day. THERE’S NO OTHER LOVE LIKE THE LOVE FOR A BROTHER. THERE’S NO OTHER LOVE LIKE THE LOVE FROM A BROTHER. Jonathan Hernandez used to be D.J. 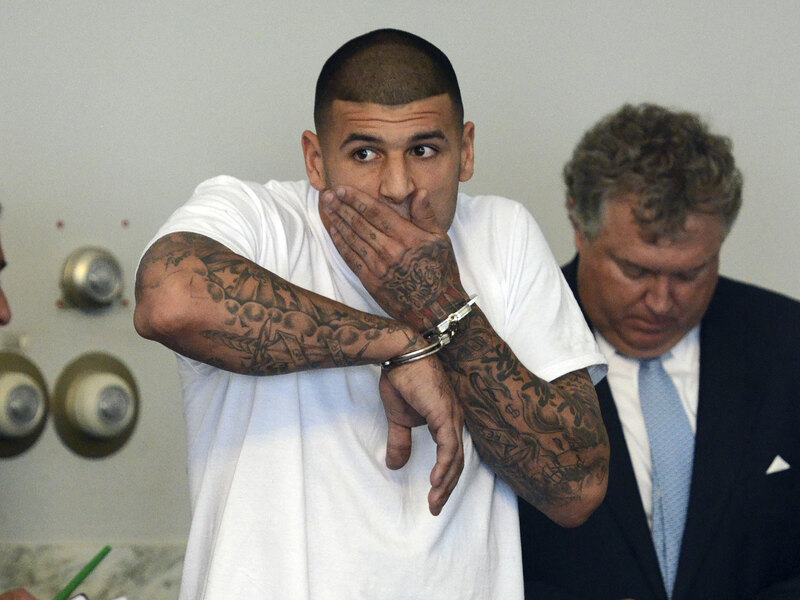 Hernandez, but his clients don’t know that unless he tells them. He usually does not tell them. There’s a lot that he does not tell them. They need to know when their roof will be fixed, not that their roofer sometimes takes calls from his famous brother at the Souza-Baranowski Correctional Center in Lancaster, Mass., or that he still feels so close to his incarcerated brother that he says, “I feel him smile through the phone.” They care about their own houses, not the one where their roofer lived back when he was D.J., sharing a room for 15 years with a man who has since been convicted of one murder and indicted for two more. When all is said and done, they’re more focused on the job’s paperwork than the zippered leather folder that holds it, the one engraved with a Hawkeyes logo and the words IOWA FOOTBALL. D.J. 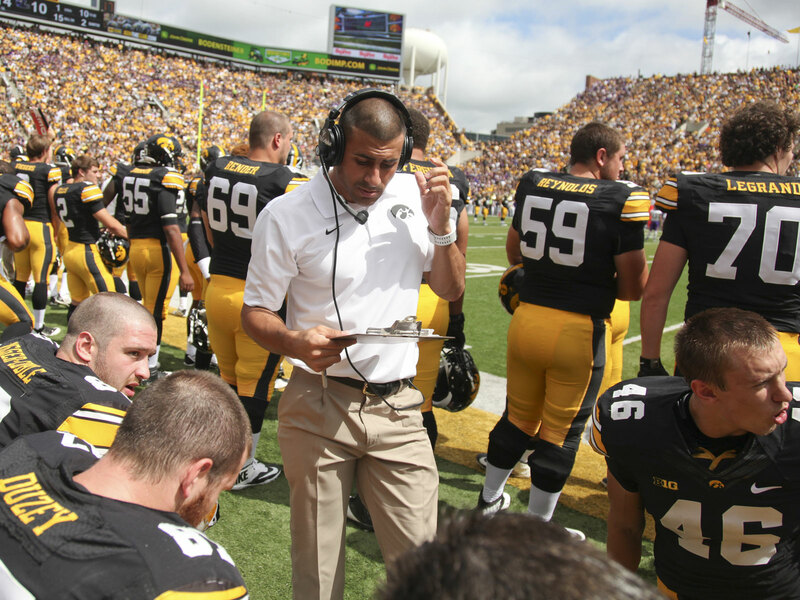 Hernandez sits at his desk, just another blade of grass on the coaching landscape: a graduate assistant at Iowa, making $18,144 a year to do what he’s told. But D.J. doesn’t give a damn about the money, and he doesn’t always do what he’s told, either. At 27 he has already checked off so many boxes for a successful coach: soaring ambition, relentless work ethic . . . failed marriage, disregard for material things . . . superior knowledge of the game . . . inflated sense of self. 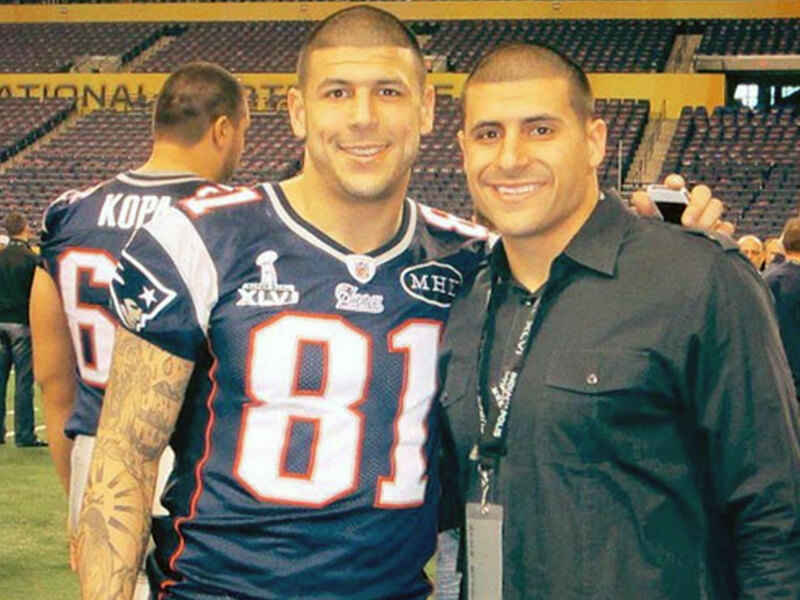 Hernandez arrived at Iowa in 2013 as a graduate assistant, then watched helplessly from afar as his brother became the lead suspect in a murder investigation. During one game he will speak out of turn and get chewed out by offensive line coach Brian Ferentz; when D.J. apologizes, Ferentz will tell him, “You don’t f------ listen!” Someday D.J. will run his own program. Someday he will do the chewing out. For now he must act like a graduate assistant. His phone rings. It’s his younger brother, Aaron. Not surprising; the two speak almost every day. Aaron is a star tight end for the Patriots. He has completed one year of a seven-year, $40 million contract. He has paid off some of D.J.’s credit-card debt, and when they grab dinner or hit a club, Aaron pays. But their relationship is unchanged by money, geography or celebrity. D.J. says Aaron is his best friend. To him every conversation might as well be taking place in their old backyard in Bristol, Conn. He answers. Aaron sounds quieter than normal. Odin? Sure. D.J. has met Odin Lloyd a few times. Nice guy. Just a few weeks earlier they all hung out at Aaron’s house in North Attleboro, Mass., along with the Hernandez’s childhood friend Stephen Ziogas and Aaron’s pal Ernest (Bo) Wallace. They played pool and used Aaron’s sauna; Aaron, who needed to get in shape for training camp, had even worn a full sweat suit in the sauna. Afterward Aaron’s barber came by to give him a haircut. Hernandez caught nine passes for 83 yards in what would be his final NFL game, a playoff loss to the Ravens on Jan. 20, 2013. Aaron’s fiancee, Shayanna Jenkins, was there too, but she stayed upstairs most of the time with Avielle, the daughter she had with Aaron, and her sister Shaneah, who was dating Lloyd. On some level Aaron knew the worst that could happen. He feared it. Aaron had one friend, an ex-con named Sharrod, who made him particularly nervous. He didn’t say why. He just said he was worried about his family’s safety. 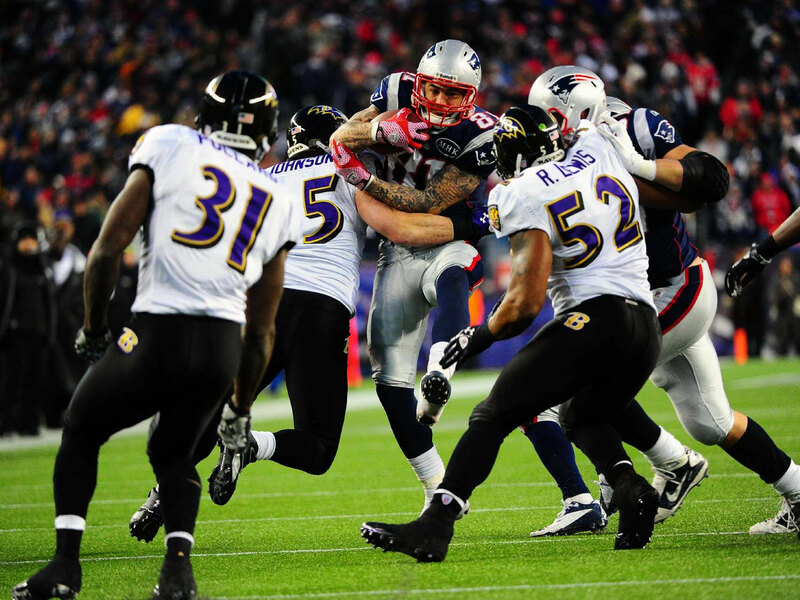 When Aaron bought his house from former Patriot Ty Warren, he even installed an elaborate video-surveillance system. That last time D.J. saw Odin, Aaron had left the house with Lloyd. But Aaron could have left with anybody and had fun; he is social tofu, absorbing the flavor of whatever he touches. Ever since Aaron was a kid, he had this desire to like and be liked, no matter the circumstances. Aaron was amused. You’re not going to stab me. The kid stabbed him above the knee. Aaron was bigger and tougher. He could have kicked the crap out of that kid. But he didn’t. He gave him five minutes to get out of sight. The kid bolted. Aaron let him go. Ziogas, who played linebacker at Brown University, says, “I’ve never met anybody as socially versatile as Aaron Hernandez.” He could be playing video games with a nine-year-old one minute, then bonding with Myra Kraft, the sexagenarian wife of Patriots owner Robert Kraft, and then hit a club with a friend who has two priors for drugs. . . . Selected two rounds and 71 picks apart in the 2010 draft, Hernandez and Rob Gronkowski had developed into a dangerous tight end tandem unlike any other in the league over their first three seasons together. Anyway, maybe a simple question deserves a simple answer. “Yes,” D.J. tells Aaron, he remembers Odin. Seems like a good guy. Aaron says Odin is dead. A murder? D.J. sits at his desk, “frozen,” he later says, “within my own body.” Aaron promises he is innocent: “D, I swear on everything. . . .” And D.J. believes him. But still. . . . Murder? D.J. does not press his brother for details. Before he can process the news privately it becomes public, streamed across the bottom of his TV as casually as CELTICS 62 76ERS 59. Police are investigating Aaron Hernandez in connection to a possible homicide. . . A nation is shocked. 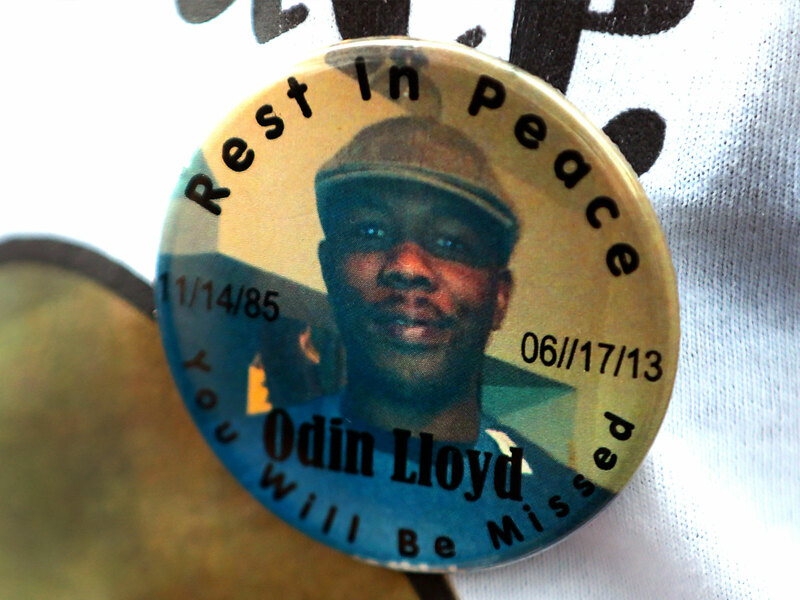 . . Odin Lloyd has been found shot to death in an industrial park near Aaron’s house. D.J. wants to hug him. Forget the machismo of football. The Hernandezes love each other and don’t care who knows it. When D.J. attends Patriots games, Aaron stands on the field before kickoff and blows his brother a kiss. Now D.J. wants to go straight to North Attleboro again and hold his 6&apos; 1", 245-pound brother . . . but he doesn’t. He thinks of his budding coaching career. He pictures himself on TV, walking onto the site of a murder investigation, and how that would look to potential employers. The two brothers connected whenever D.J. (right) traveled to see Aaron play with the Patriots, including New England’s trip to Super Bowl XLVI. D.J. is supposed to go home in a week anyway, so he does. But what is home anymore? He can’t visit Aaron. Too many cameras. His mom, Terri, still lives in the little white house in Bristol with her second husband, Jeff Cummings, but the joy that D.J. felt there as a child is gone today. Strangers lurk outside or knock on the door. A reporter brings Subway sandwiches as a way to get in the house. He drives back to the house and finds his mom on the living room couch, wailing. They had sat in that room so many times as a foursome—Terri, D.J., Aaron and their dad, Dennis. The boys would lie with their heads meeting at the right angle of the sectional couch, drinking hot cocoa and watching whatever movie they’d rented from Family Video. Now Aaron is on the news, being led out of his own house in a white T-shirt, red gym shorts and handcuffs, accused of murder. The fact that it is actually unfolding on TV only adds to the sensation that this is only happening on TV. D.J. has to convince himself it’s all real. She collapses on top of D.J., who holds her and rubs her back. He cries, but not because his brother has been arrested. He cries because his mom is blaming herself, a life’s work undone. As Aaron was led out of his house in handcuffs while news cameras rolled, D.J. consoled his mother at home in Bristol. Two days later D.J. ends up at a diner with some cousins and he warns them: “Somebody may try to pick a fight. Ignore them.” Of course, somebody tries to pick a fight. The cousins do not ignore them. Punches are thrown, ketchup bottles fly, and D.J. sits still, trying to apply the discipline of his football career to a world that has lost any semblance of it. He walks out before the fight ends, before police arrive, but still it’s deemed newsworthy. 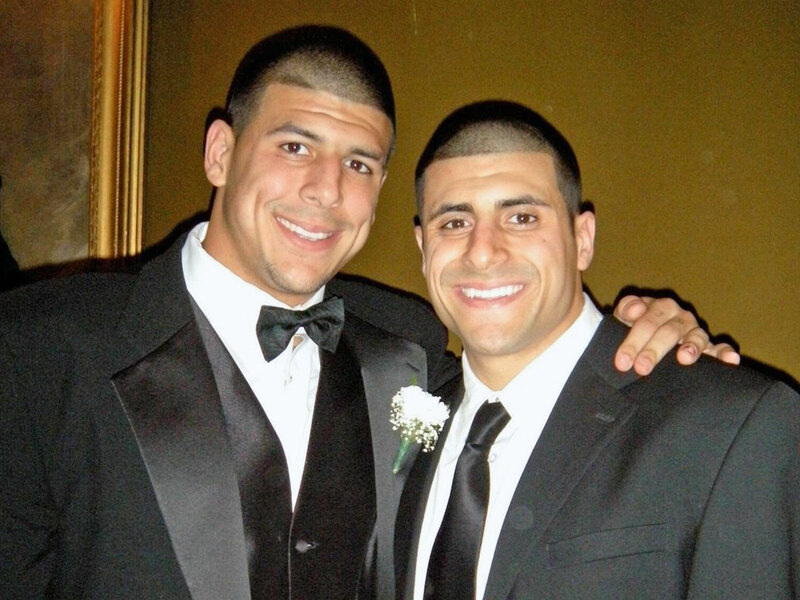 HERNANDEZ’S OLDER BROTHER WAS PRESENT AT BAR FIGHT, USA Today says. D.J. realizes that even in Iowa City he has been the victim of identity theft. He is no longer a promising college football coach. He is the look-alike brother of an accused murderer. D.J. goes back to Iowa, eats at a restaurant called Formosa and it all happens again: A group of young men spot him through a window, point and make bullet sounds. There is no fight this time, but D.J. realizes that even in Iowa City he has been the victim of identity theft. He is no longer a promising college football coach. He is the look-alike brother of an accused murderer. The media covers the story like a spreading fire, the narrative chasing the news. As reporters attempt to explain the shocking events, Aaron’s life story gets stuffed into a single sentence, highlighting his family’s lowest moments and biggest mistakes: Aaron was a prodigy in Bristol, but his father was a former small-time thug and his mother had been arrested as part of a bookmaking bust; when Dennis died young and Terri remarried, Aaron rebelled and became a thug—and then a murderer. Write it that way and Aaron’s arrest is no surprise. D.J wonders how so many people can claim to know his brother better than he does. Jonathan needs a rental car but not GPS. He knows all the streets, but he’s not 100% sure what is on them. He’s 30 now. He has not lived in Connecticut in five years, and every trip home is the opposite of an archaeology dig: At any turn, he might discover something is missing. They have ’em. He buys two for himself. They’re as good as he remembers. It is just after dawn. He drives up Greystone Avenue and back down Pleasant View Avenue. He parks. “I’m going to get out,” Jonathan says as he pulls up to the back of a small white house. “They can yell at me if they want.” He opens the car door and says, “This is our backyard.” Well, it was their backyard. Terri moved out two years ago. 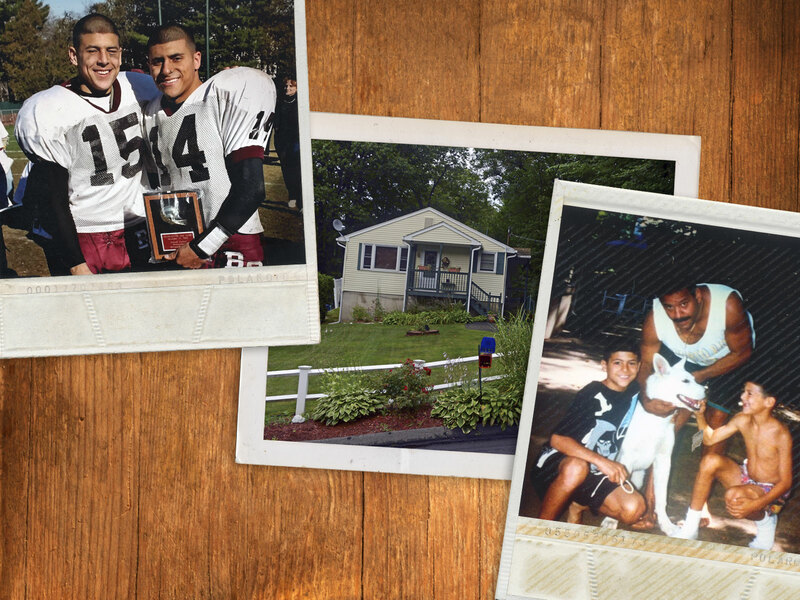 If you believe Aaron Hernandez grew up to be evil, then the murder of Odin Lloyd began here. It began with Dennis Hernandez watching The Price Is Right while his five-year-old son Aaron rested his head on Dennis’s belly. It continued in the backyard, with the sound track from Space Jam on the CD player, the family’s purebred white German shepherd, UConn, pacing behind a gate, and grandma Edith Valentine watching the boys play basketball on the driveway court from her chair. There were no easy layups. When one brother drove to the hole, the other one fouled him into the grassy bank behind the basket. Yes: If you believe Aaron Hernandez grew up to be evil, then the murder of Odin Lloyd began here, and his older brother was a witness. Aaron and D.J. nurtured dreams of becoming professional athletes in their modest Bristol home, supported by their father, Dennis, and their dog, UConn. Jonathan looks around. A childhood home can seem smaller when you return, but this one felt small from the beginning. When Aaron lay in bed, the door to his and D.J.’s room would hit his feet. Sometimes the boys had to navigate around Terri, who ironed clothes in their bedroom. But size is not just measured in square feet. Dennis never hid his wild past from his sons. (Yes, it was wild; but it was also the past.) His boys knew him as the life of a party where everybody was invited. Each year he would host the What’s Up three-on-three basketball tournament, with burgers on the grill and hundreds of people watching. Dennis was a custodian in the Bristol school district, but sometimes it seemed more like he was the mayor. Terri was an administrative assistant at South Side Elementary School. She put together collages of family photos and sports articles, and she hung them above the boys’ beds. She loved to buy flowers and plant them as soon as she got home. The house on Greystone Avenue was defined by work—the work Dennis and Terri did to afford and maintain it, and the work the brothers did when they lived there. Jonathan remembers sneaking into the basement during middle school and quietly lifting weights against the wishes of his father, who believed he was too young. The boys would run suicides up and down the hilly streets, and they would leave a jump rope at the top for when they were done running. Then they sat and enjoyed the view of their city, lit up and beautiful, and talked about their dreams of becoming pro athletes. Aaron&apos;s three-year totals at Bristol Central: 157 catches for 3,437 yards and 45 touchdowns. Growing up the boys had everything they needed, but not everything they wanted, and good luck finding a teenager who can tell the difference. Jonathan remembers crying because other kids had the latest outfits from Abercrombie & Fitch, or because they had new bicycles and he didn’t. One day he came home from basketball practice to find police inside the house. His mother was at the kitchen table, crying. His father was upset. Terri had been busted for helping a bookie. Only later did Jonathan connect her crime to his Abercrombie cravings. D.J. joined his mother Terri (left) for a 2014 superior court hearing that moved Aaron to a jail closer to Boston while he awaited trial. Terri did not serve any time in prison (all charges were dropped), but the boys were humiliated; Jonathan still remembers a friend teasing him by bringing a newspaper article about his mother’s arrest into school. There were subtle differences between brothers—small at first, but growing larger the further they got from the womb. Aaron, three years younger, was more physically gifted in almost every way. (The exception: long-distance running.) He also had a disproportionate hatred of being alone. And he thrived on outside encouragement. When Aaron was at Bristol Central High and Jonathan was off at college (and even later when Aaron was at Florida), Jonathan wrote his younger brother letters before almost every game. Aaron would tuck them into his socks. He never wrote back. Jonathan was so thoughtful about the world and his place in it that he would sometimes just sit “right off of this window,” he says as he stands in the backyard, gesturing toward the house. “I could see this light over here, and it was just beautiful. You’d see the reflection off the snow, and . . . I don’t know. I’m a weird dude. “You’d see this light here. Right here. I would just watch the snow, and it just reminds me of life. Everyone wants things to happen overnight. You see the snow hit the ground, and nothing happens. It just melts. But eventually it builds up into something. What’s new? He’s serving a life sentence. What will ever be new again? Jonathan first drives to Bristol Central, where he’s greeted like some combination of visiting dignitary and old fraternity brother. Great to see you! . . . Who let the big Puerto Rican in here?! He hugs old coaches and updates old teachers: He’s living down in Texas now, roofing; things are going well. He points to the room where he once enjoyed making pottery and visits the weight room. He remembers which pieces of equipment have survived since his era, right down to that stool he never used, because weight rooms are no place for sitting. He walks out to the Rams’ practice field. On Aaron’s first day of football as a freshman, he put a double move on a senior at the line and caught a pass. The senior pushed him after the play was dead, but Aaron just smiled and went back to the huddle. 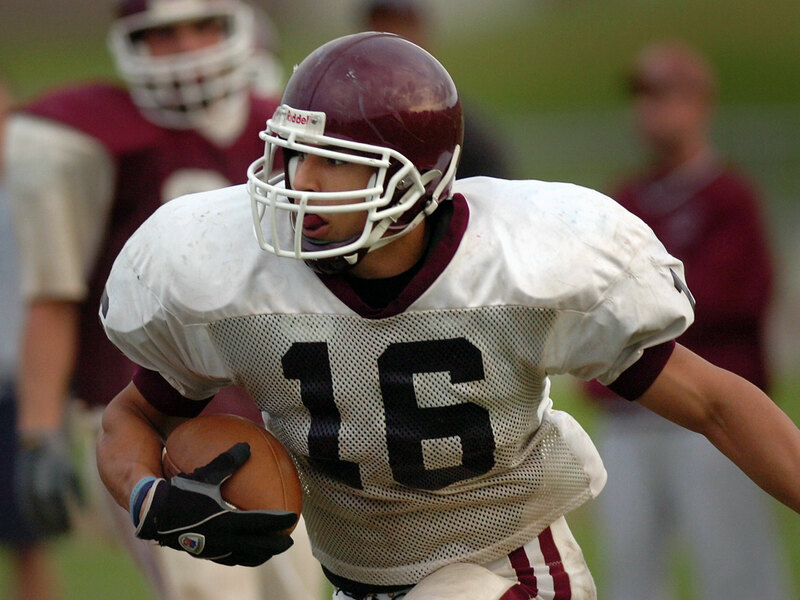 A local news station report on Aaron as a high school senior, bound for Florida as the nation’s top prep tight end. Both brothers wanted to win, but Aaron also wanted to carry the whole town on those big shoulders, to win the Super Bowl and bring the Lombardi Trophy back home, to make strangers laugh and neighbors feel like family. Ziogas says Jonathan would sometimes blow past him in the hallways, pretending not to know him. Aaron, though, would say hello even if he’d never met you. He wanted to make everybody laugh. Is this it? The first snowflake? Is this a hint at why Aaron ended up in an industrial park, standing over Odin Lloyd’s bullet-riddled body? Is it possible that Aaron embraced the people he should have shunned, or that when his father died suddenly in 2006—when the person he loved most was taken from him—it was such a shock to his soul, such a personal rejection, that . . . He pauses, as though he’s turning the thought over in his head, examining it from all sides. At Bristol Central, Jonathan walks back upstairs. The school’s official policy in regard to Aaron Hernandez has been deletion. No pictures, no trophies, no sign of the best athlete ever to walk these halls. But memories cannot be deleted. Sixty-seven-year-old athletic director Bob DeSantis, who coached both boys as well as their father, approaches with a CVS envelope stuffed full of pictures of the Hernandezes. The first time Jonathan visited Aaron, he was nervous. He surveyed the lobby, taking measure of the kind of people who visit prisons. Now he’s one of those people. He wonders what others think when they see him. Jonathan’s uncle Vito—Dennis’s brother—comes by too. He works here. This has bothered Jonathan since he arrived from Texas a day earlier. Visitors at Souza-Baranowski may not wear jeans, shorts or work boots. Jonathan forgot. He has borrowed dress pants and shoes, but he is worried that the shoes are too casual and he won’t be allowed to see his brother. Vito: “Is it easy to go in? But he knows Vito probably won’t go. Truth is, the drive to Souza-Baranowski is super easy—about two hours. Going in is not. The first time he visited Aaron, Jonathan was nervous. He surveyed the lobby, taking measure of the kind of people who visit prisons. Now he’s one of those people. He wonders what others think when they see him. D.J. is a stoic at work, acting strong for his players, focused on Iowa football. But at night he lies in bed crying, gripping his pillow as hard as he can. He dreams that he’s in the industrial park on the night of the murder, only he’s playing all the roles: He is Odin, he is Aaron; he is dead, he is alive. He wakes up in a sweat, crying uncontrollably. He has one recurring nightmare so stark that he starts screaming, only to have his mother wake him and say, “It’s going to be O.K.” . . . except that his mother isn’t really there. He has only dreamed that. He is still sleeping. He is trapped inside a nightmare inside a nightmare inside his life. 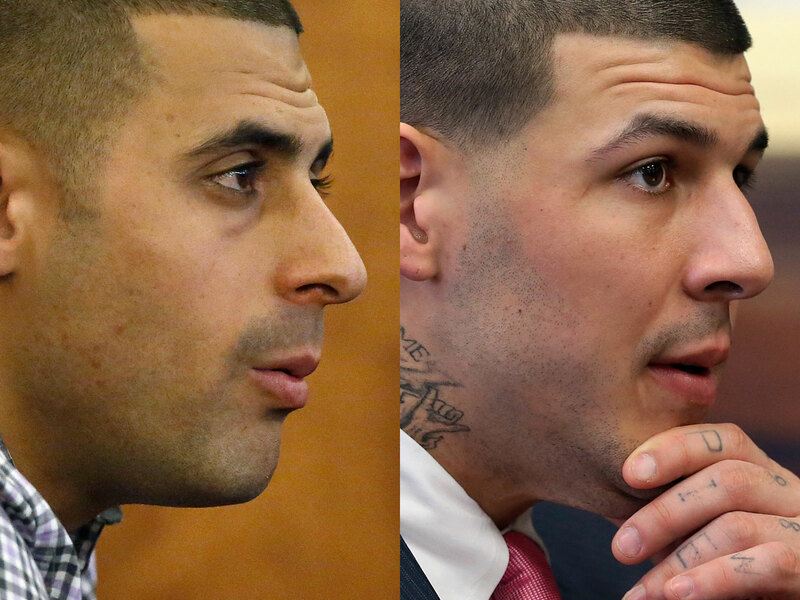 Prosecutors argued that surveillance video from Aaron’s house the night of Lloyd’s murder showed Hernandez holding a gun in his right hand, behind his back. D.J. thought he understood public embarrassment. Once, when he coached high school ball in Southington, Conn., one of his assistants found a wristband with the opponent’s plays on it. D.J. says he used it for four downs before realizing it wasn’t helping, but even trying to use it was wrong. He was caught and suspended for one game. He was humiliated—24 years old and already branded a cheater. Suddenly that seems like a parking ticket. Incredibly, the news on Aaron’s case has only gotten more horrifying since his arrest. He has since been indicted for the 2012 murders of two more men, Daniel de Abreu and Safiro Furtado, outside a bar in Boston. According to prosecutors, Abreu spilled a drink on Aaron and refused to apologize; so Aaron, the guy who once let somebody walk away after stabbing him, gunned Abreu down, along with his friend Furtado. Aaron pleaded not guilty. But there is speculation that Lloyd knew something about those murders, and that’s why Aaron killed him. The kid who wanted to be everybody’s friend has been branded as football’s Al Capone, blowing away anybody who crosses him. D.J. still plays tic-tac-toe with him. Hangman too. D.J. draws the games on a piece of paper and mails them to Aaron in jail; Aaron makes his moves and sends them back. D.J. is finishing his second year as a Hawkeyes graduate assistant. 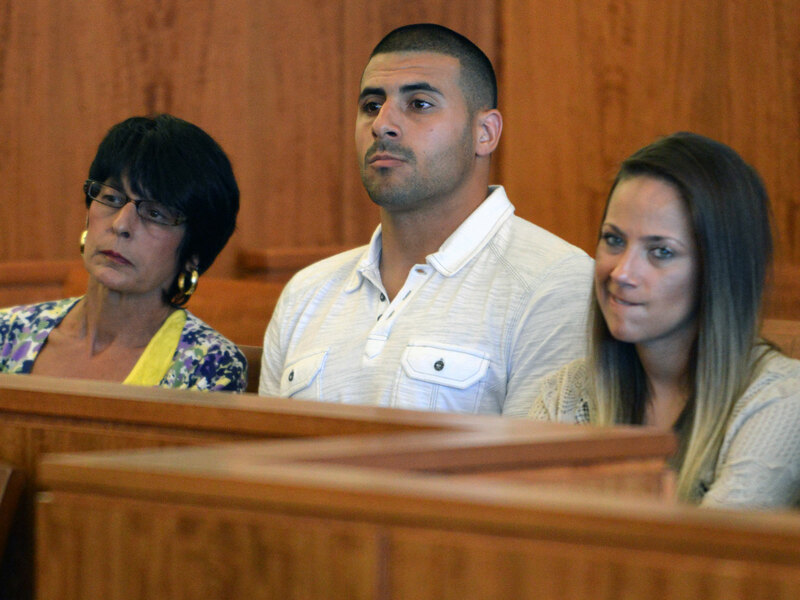 It’s time to find a full-time job, but nobody is willing to hire Aaron Hernandez’s brother. So he keeps looking. He flew to Massachusetts for the first two days of the trial, employment prospects be damned; now he’s back in Iowa City. There are two monitors on his desk next to his work computer. On one is video of Iowa’s offense. On the other, he types “Aaron Hernandez trial” into a Twitter search bar so he can find a live feed of Aaron’s trial for the murder of Odin Lloyd. D.J.’s core beliefs are in conflict with each other. He believes heinous crimes should be punished severely. And he believes family comes first. So which matters more? Is he rooting for justice or for his brother? Aaron has maintained his innocence, both publicly and to his brother. “D, I love you,” he says. “I swear on everything, I didn’t do it. . . .” D.J. says Aaron has never lied to him; he clings to that like a child clings to his favorite blanket. Besides, there are reasons for hope. The weapon used to murder Lloyd has not been found. And a clear motive has not been established; a judge rules that the prosecution cannot mention the alleged murders in Boston. 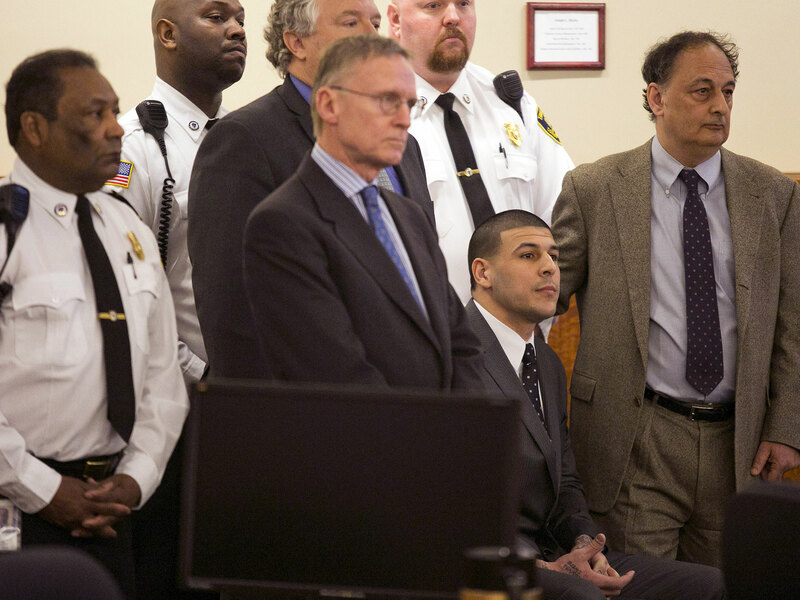 But under Massachusetts law, prosecutors don’t have to prove that Aaron pulled the trigger. If they can prove that Lloyd’s murder was a “joint venture,” then anyone who actively participated can be found guilty. Maybe Aaron has never lied to his brother, but it’s becoming clear that he has not always told the whole truth, either. D.J. says he knows his brother smoked pot often. He assumes he did it every day. Aaron has explained that he would rather stay home and get high than go out, get drunk and possibly get into trouble. But Rolling Stone has written that Aaron also smoked a lot of PCP; and Aaron’s attorneys are arguing that Ortiz and Wallace were smoking PCP the night that Lloyd was killed, sending them into violent psychoses. Lloyd is described alternately as Aaron’s good friend and his “blunt master.” D.J. hears testimony about Aaron’s “flophouse” in Franklin, Mass., but he doesn’t even know what a flophouse is. He has no idea that Aaron keeps this apartment. Aaron has maintained his innocence to his brother, but Jonathan rarely presses for new details about his case. D.J.’s core beliefs are in conflict with each other. He believes heinous crimes should be punished severely. And he believes family comes first. So which matters more? Is he rooting for justice or for his brother? Is it more important that the jury find Aaron not guilty or that the trial actually proves his innocence? Even a detached, impartial observer may wonder whether Aaron killed Odin Lloyd. No eyewitnesses testify. No murder weapon is found. But there is far too much evidence to ignore all of it. Aaron’s own lawyers finally admit that he was in the industrial park when Lloyd was killed. 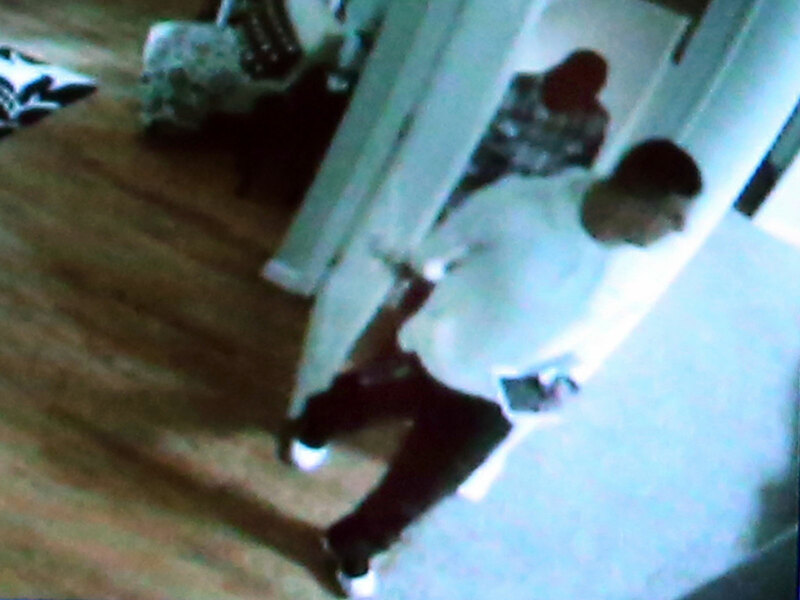 Hernandez’s own home surveillance video shows him carrying what looks like a gun. Shayanna testifies that after the murder she removed a box at Aaron’s request, but she didn’t check to see what was in it; and she dropped it in a dumpster, but she can’t remember where. Oceans don’t smell this fishy. Lloyd, who was dating the sister of Aaron’s fiancée, had a football career of his own, playing for the semi-pro Boston Bandits. D.J. acknowledges: Aaron was, at the very least, “involved.” And there is no defense for that. He wonders about Aaron’s almost magnetic pull toward the wrong crowd. He thinks Aaron ended up in this situation because of “drugs and people who don’t have the best intentions for you.” But he knows that pinning this on Ortiz or Wallace or anybody else is a cop-out. “I don’t blame them at all. They’re just influences.” At some point, Aaron became the center of a social circle that he should have avoided completely. On the computer screen back in Iowa, D.J. sees Aaron’s tongue roll around the inside of his mouth, and where others see a fragment of emotion, D.J. recognizes: That’s Aaron’s look of complete devastation. Even that does not come close to explaining how Aaron Hernandez ended up here, on April 15, listening to a jury declare him guilty of first-degree murder. It is a verdict that some desperately want, many feel is deserved and nobody enjoys. In court the mother of the murderer and the murdered both cry. On the computer screen back in Iowa, D.J. sees Aaron’s tongue roll around the inside of his mouth, and where others see a fragment of emotion, D.J. recognizes: That’s Aaron’s look of complete devastation. D.J. bursts into tears and drops his head in his hands. Fellow graduate assistant Chris Polizzi puts his hand on D.J.’s shoulder. SI Now: Aaron is found guilty of first-degree murder on April 15, 2015. Tell Jonathan that his plight is a mosquito bite compared to what happened to Odin Lloyd, and he says he understands. When he says women were wary of dating him, he quickly adds: “I understand why. ‘All the men in the world and you choose this one? Really?’ ” He says the word understand so much, in so many different forms—I understand. . . understandably. . . it’s -understandable—as if to affirm that he is not paranoid, crazy or bitter. He does not think the world has conspired against him. He understands. Shortly after the conviction, D.J. makes two key decisions. He will leave coaching, and he will no longer be D.J. That was a sports name, he says, and he doesn’t need it anymore. Time to start fresh. He won’t go by his first name, Dennis, because that belongs to his father. So his middle name, Jonathan, it is. He hears about a job working for a roofer in Dallas and decides to try it out. Aaron, meanwhile, is sentenced to life in prison without the possibility of parole. Just like that, two football dreams have died—but so did Odin Lloyd, and people think that’s all that matters. Understandably. Jonathan clears dirt off his father’s gravestone. Dennis was 49 when he went in for routine hernia surgery. The next day, Jonathan knew something wasn’t right. Dennis, who never complained, said he wasn’t feeling well. Jonathan remembers crying as he left the hospital, certain that something awful was about to happen. The last hours of the father’s life are a blur to the son: infection, intensive care, tubes coming out of Dennis’s body, doctors yelling “Clear!” as they employ the shock paddles, blood dripping from the patient’s nose, Terri and the boys resting their heads on Dennis’s chest, crying, their tears welling up around his cross pendant. Jonathan thinks back to the receiving line at the funeral. At 19, he was a hot mess; Aaron, 16, was a cold one. He was bawling; Aaron was not. Even in the moment, when he could have been lost in his own sadness, the older brother noticed. Another snowflake. As the trial wore on, D.J. (left) could not shake his resemblance to his brother, even once he returned to work in Iowa City. Dennis died just as Aaron transitioned from local star to national prospect. There were plenty of people ready to be his friend. He accommodated all of them. If Dennis had lived, would his approval have satisfied Aaron? D.J. 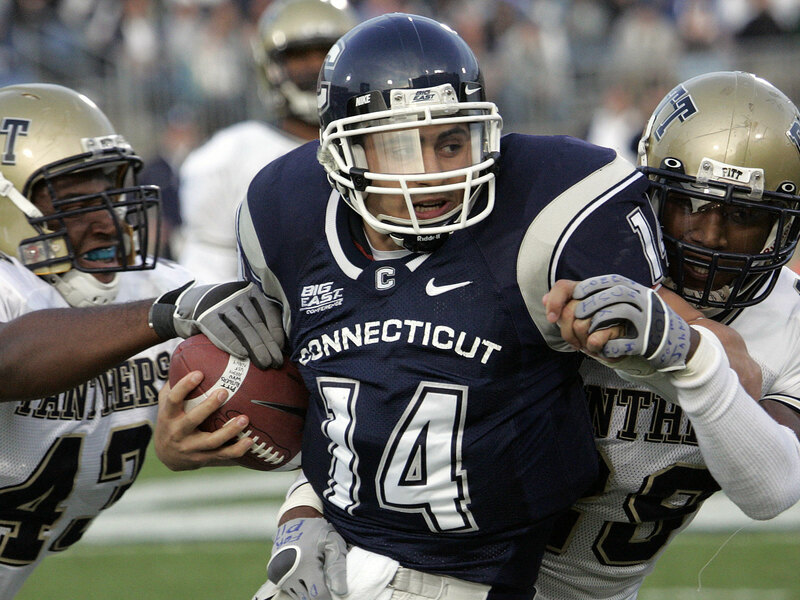 spent his first three years at UConn playing quarterback before switching to wide receiver in 2007. In the aftermath, Terri got together with Cummings, who had been married to the boys’ cousin Tanya. (In 2010, Jeff was found guilty of second-degree assault for slashing Terri’s cheek.) That hit Aaron from two angles: His mother was suddenly with another man, and Aaron had been close with Tanya. Aaron has a tattoo running down his left forearm, one of his father’s favorite sayings: IF IT IS TO BE IT IS UP TO ME. It should have been a motto of self-reliance. But Aaron instead started acting like the world had stopped doing him favors and he would no longer ask. The snowflakes started piling up: a bar fight at Florida, where he was a freshman in 2007; at least one positive drug test; Gators coaches worrying every time he went home to Bristol. Aaron turned pro in 2010, following his junior year, even making the announcement on the fourth anniversary of Dennis’s death. He watched the draft on a couch in his brother’s apartment in Mansfield, Conn. Terri wasn’t there. The first round passed. So did the second. Jonathan remembers “going nuts,” looking at his brother and thinking: Do you understand what’s happening right now? 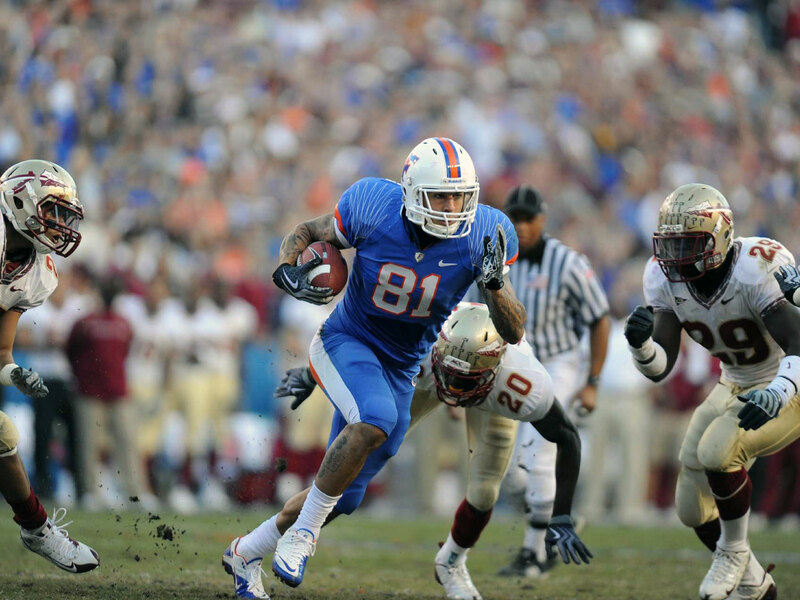 At Florida, Aaron turned in two productive seasons as one of Tim Tebow’s favorite targets, but character concerns dropped him to the fourth round of the 2010 draft. A first-round talent, Aaron sank to the middle of the fourth, a drop that would scare some men straight. But Aaron emerged neither scared nor straight. He believed that his talent, work ethic and football intelligence would triumph, no matter where he was drafted or how he lived his life. If it is to be it is up to me. Aaron has a tattoo running down his left forearm: IF IT IS TO BE IT IS UP TO ME. It should have been a simple message of self-reliance. But Aaron instead started acting like the world had stopped doing him favors and he would no longer ask. Six years later, Jonathan stands in the morning sun giving a tour of Bristol Central’s Muzzy Field. As kids he and Aaron would play tackle football behind the bleachers while the adults watched high school games; eventually they grew older and moved over to the big field, where between them they scored 123 touchdowns for the Rams. They played one season together, as senior quarterback and freshman receiver. On one play in their opener, Aaron was supposed to take the top off the defense, but the secondary dropped back and he ran an under route instead. His brother passed to him. Touchdown. He exhales. His voice starts to crack. He makes a sound with his tongue, click-click-click, like the rewinding of an old film projector. Machines keep hammering away. Tears form. That sound from his mouth again, click-click-click. . . .
His voice stops. His chin quivers. The Souza-Baranowski Correctional Center is surrounded by the staples of American life: roadside mailboxes, lawns that long to be mowed, firewood waiting in bundles for whenever winter comes. 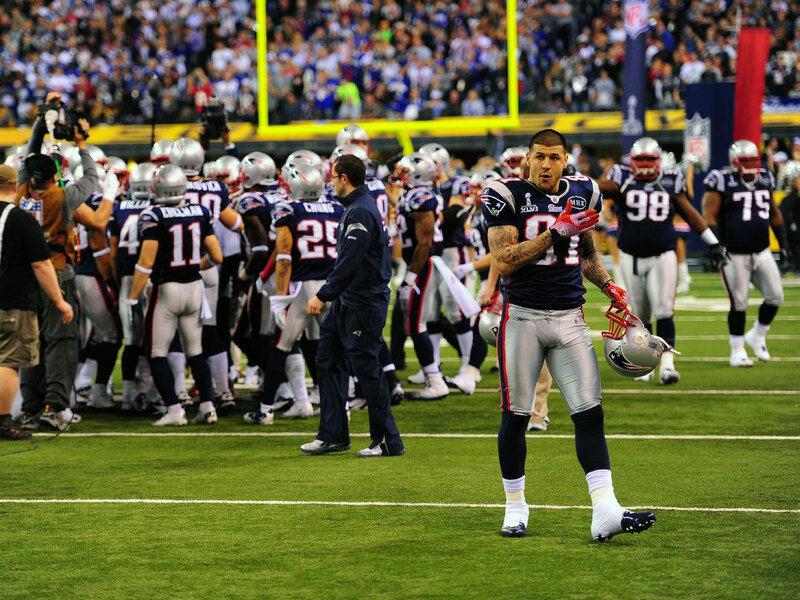 For Aaron Hernandez, all of this might as well be on the other side of the world. There is a Dunkin’ Donuts nearby, filled with laughter Aaron will never hear, from girls he will never see. Then again, neither will Odin Lloyd. Jonathan parks and walks in. He fills out his visitors’ paperwork, which is required but unnecessary; whenever he visits, somebody always assumes he is Aaron’s brother. He grabs a number from the kind of ticket dispenser you might see at a deli counter. The woman in front of him gets 81, Aaron’s jersey number with the Patriots. Jonathan gets 83. 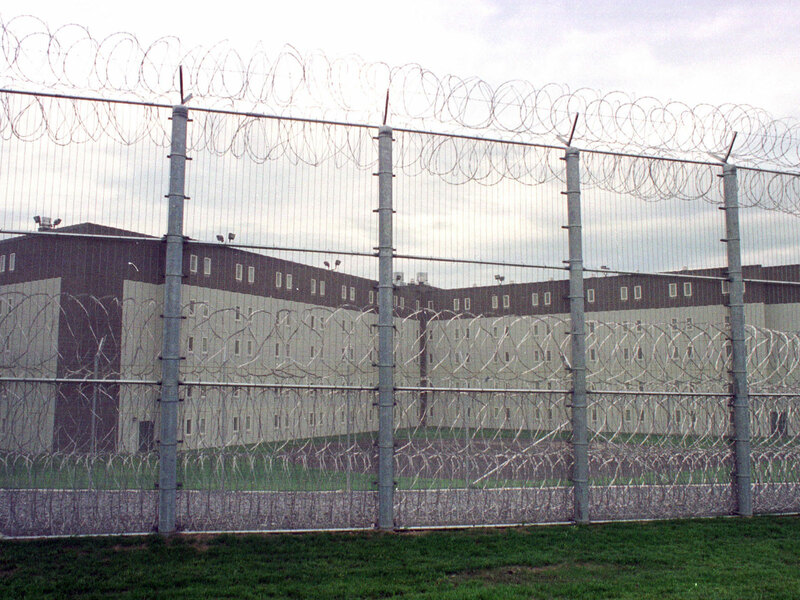 Aaron is serving out his life sentence for Lloyd’s murder at the Souza-Baranowski Correctional Center in Lancaster, Mass. He takes off his belt, removes his shoes and rolls his sleeves up and his socks down, per requirements. He is hoping for a contact visit. The last time he was here, in December, the brothers were separated by a piece of glass. There are reports that Aaron has been in three prison fights, the last in August 2015; limiting his contact visits is a logical punishment. Jonathan gets a stamp on his right wrist. On the other wrist he wears a tattoo of an open book. He got inked after the guilty verdict and chose the details carefully: The left-hand page represents the past and is partially flipped up, because “you don’t want to harp on the past, but you want to remember it.” The right-hand page represents the future; a quill is still writing the story. There are no words, just the lines of an electrocardiogram, because “you need ups and downs to have a pulse.” A cross lies next to the book, disconnected, a reminder that it is easy to lose faith. Jonathan waits for somebody to say he can see his brother. This will be a noncontact visit. When he is called, Jonathan walks into a long room with a row of 14 seats. Twelve of them are empty. Somebody is sitting in number 14, across the glass from another prisoner. Jonathan is told to sit two down; he thinks that means two down from number 14, and so he sits in number 12. Aaron walks in wearing a two-piece gray prison suit with a white T-shirt underneath. But a guard puts him in number 13, two down from the wall. The brothers are suddenly caught in a slapstick routine—Aaron sees Jonathan in number 12 and goes there while Jonathan sees Aaron at 13 and goes there—and they get a laugh out of it. But beneath the comedy lies another little indignity: They are supposed to be in seat number 13, meaning that, in a mostly empty room, they have been seated immediately adjacent to two other people. Any hint at privacy has been erased. How is Aaron doing? You might not care. Perhaps you just see a famous athlete who committed an unspeakable crime and who does not deserve a teaspoon of your concern. Understandable. He is not your brother. But Jonathan is pleased that Aaron, at a solid 255 pounds, still looks like an NFL tight end. Aaron organizes workouts for his fellow prisoners: pull-ups, dips, push-ups—whatever it takes, although he tries not to bench-press much himself because he does not want to reinjure his left shoulder. Jonathan (right) has completely overhauled his life since Aaron’s conviction. Aaron has picked up chess in prison, and he tells his brother, “You’ve gotta start playing.” He loves the mental challenge and, well, this feels weird considering how competitive they were as kids, but he doesn’t care if he loses. Jonathan gets it. He tells Aaron he just lost a golf match and didn’t really care, either; and speaking of golf, remember the time they played in the rain? Aaron swung, lost his grip and sent a club into the woods. For such a gifted athlete, Aaron really is a terrible golfer. Was. He was. He asks about their grandmother. 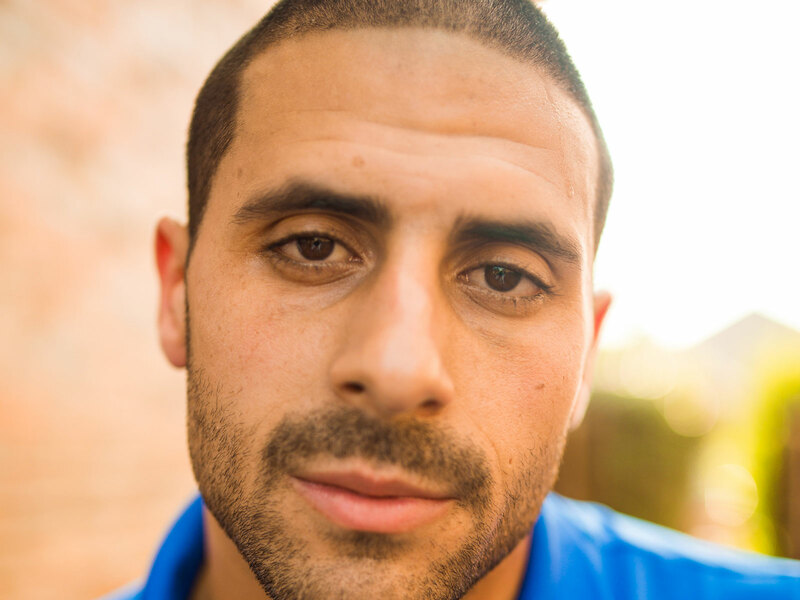 In one of his first letters from prison, Aaron pleaded with his brother to enjoy everyday occurrences—not just the conveniences of modern life, but the inconveniences too, like when it starts raining as you’re walking to your car. Jonathan thought, Wow, he is really starting to change. Aaron says he doesn’t think about where he is or how long he will be there. He tries to stay positive. He is visibly thrilled when he talks about Avielle, who’s now three. And he says Shayanna is doing well. Jonathan does not have much of a relationship with her, which he calls “kind of a mutual decision;” they never knew each other that well. As the years pass their relationship may be defined more by these prison visits than by their 15 years of sharing a bedroom. Jonathan tries not to worry about that. Today’s stay is about to end. Aaron says they should set a weekly time when they will speak. The brothers want to hug one another but can’t. They put their knuckles up to the glass, blow each other kisses and go back to their lives. Watching on television, Jonathan could read the pain on Aaron’s face as he was found guilty of murder and sentenced to life in prison. At the end of a long workday, driving along a winding road in a suburban neighborhood, Jonathan slows down and leans forward. He gestures toward another roofer. Storm chasers don’t live in Dallas. Many of them don’t even live in Texas. They come from as far as Colorado when the hail hits, like prospectors in some kind of postapocalyptic gold rush, knocking on doors and promising to fix roofs ASAP. Some do great work. Some just do quick work. Some leave town after they cash the first check—you don’t know it until you stare out your window one day, call a number and nobody answers. Then you realize: That guy is never coming back. “You’ve got storm chasers who will not be here in a couple of months. High Rise will always be here,” Jonathan says of his roofing company. “Those friendships and relationships—that’s why people call me when a storm hits. Before he became a roofer, Jonathan was like the rest of us: He could drive past a thousand roofs and not notice a single one. Now he spots every stain, missing shingle and mismatched patch job. Jonathan wouldn’t want to be D.J. Hernandez, Head Football Coach, if you gave him the nation’s top recruiting class and a 10-year contract. He wouldn’t want to be D.J. Hernandez, Head Football Coach, if you gave him the nation’s top recruiting class and a 10-year contract. He says, “I was so isolated and captivated within the coaching world.” He went to a Hawkeyes game last fall to see how much he missed it all. He left at halftime, convinced that he will never want to coach again. Aaron&apos;s three-year totals in New England: 175 catches, 1,956 yards, 18 TDs and so many unfulfilled expectations. Jonathan carries the most intense sadness wherever he goes, yet he is happier than he has ever been. He tries to think about his brother in prison but not the murder that sent him there. A horribly violent crime that Jonathan did not commit has led him to a peace that he did not know he craved. He wishes every day that it never happened. Aaron has hired a new lawyer, Jose Baez, who is well known for getting Florida mother Casey Anthony acquitted of the murder of her two-year-old daughter. But Jonathan barely pays attention. He has decided he will not waste his time on the Aaron Hernandez who stood in the industrial park with Carlos Ortiz and Ernest Wallace the night Odin Lloyd was killed. He says he has never asked his brother what happened. Jonathan has decided he will not waste his time on the Aaron Hernandez who stood in the industrial park the night Odin Lloyd was killed. He says he has never asked his brother what happened. Jonathan will be a father himself soon. Karen is due in November. It’s a girl. They will name her Parker. Jonathan and Karen live in a two-bedroom apartment. Someday they will move on to a house of their own, but Jonathan doesn’t much care how big it is or what it looks like. All he really wants is a big couch for family movie nights, where his daughter can be just another happy child, taking for granted that her daddy holds her so tight.